The fight to bring down an antiquated elevated highway in Syracuse, New York, is among the controversial issues being highlighted in the race for one of the state’s U.S. Senate seats. On Monday, Senator Kirsten Gillibrand, D-N.Y., told The Post-Standard she supports the effort to replace a portion of Interstate 81 with a street-level grid—a position she’s never spoken out on before. “Given where the stakeholders are—and given what I have heard from the community in the last several years,” she said, “ I really think the community grid is the better approach to not only revitalization, but to support all members of our community.” For years, higher-level politicians have shied away from taking a stance on the decade-long debate to fix one of Syracuse’s greatest transportation issues. The 1.4-mile highway viaduct cuts through the heart of the city’s downtown, segregating the community physically and economically. As of last year, it reached the end of its functional lifespan and is no longer safe for the thousands of cars that traverse it each day. Syracuse-based community groups, university leaders, and local politicians have spoken out about the dire need to address I-81. Some have come out in favor of any of the three proposed options—an underground tunnel, street grid, or rebuilt overpass—while some have stayed quiet. So far, Gillibrand is the most influential person to state her opinion. Senator Charles Schumer, D-N.Y., and Representative John Katko, R-Camillus, have declined to comment. 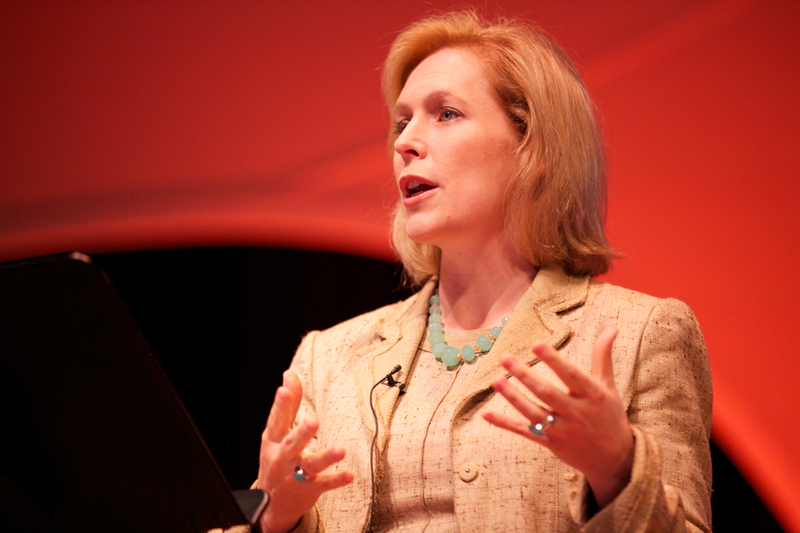 “I disagree with the tunnel folks because I think you’re just going to have a bypass of downtown,” Gillibrand told The Post-Standard. “Unfortunately, when you don’t invest in a downtown long-term, your city becomes less attractive. If you create thoroughfares and routes to skip downtown, what you get is boarded up storefront and you get a hollowing out of cities.” It’s no coincidence Gillibrand is speaking out just weeks away from the Tuesday, November 6, election for her U.S. Senate seat. Her Republic challenger, Chele Farley, criticized her decision to pick a proposal. “I think it’s a little offensive for me to make a decision for Syracuse,” Farley said in a reactionary statement. “Let Syracuse decide, but then it’s my job to get the money and bring it back so the project could get funded quickly and it could happen.” Of all three options, the underground tunnel could prove the most expensive at $3.1 billion—another reason why Gillibrand doesn’t back it. 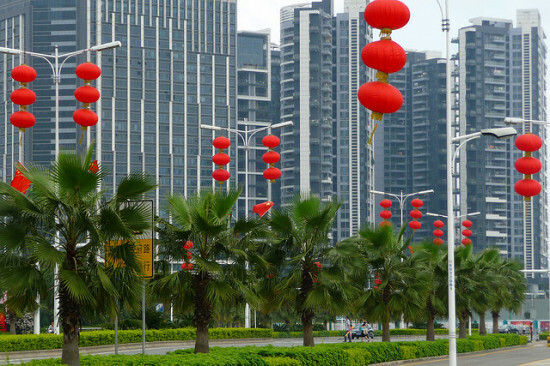 A new elevated highway would be around $1.7 billion, while a boulevard, or community grid, would cost $1.3 billion. Most of the funds will be supplied through the federal government via President Trump’s recent infrastructure rule that places priority on interstate highway projects. But some worry Syracuse’s failure to unite on a decision will prevent the city from getting the money it needs on time. Gillibrand and Farley will face off in a televised debate this Thursday at 1:30 p.m. on WABC-TV. Whoever wins the Senate seat will take on the task of pushing the project forward based on the community’s final decision. The New York State Department of Transportation is now working on a new environmental impact study surveying the three options. It’s set to be published in January when a public commentary period will open. A small sliver of urban infrastructure has been both the bane and blessing of one city in Central New York for 60 years. Interstate 81, an 855-mile-long highway stretching from Tennessee to the U.S.–Canadian border, sliced through downtown Syracuse upon its completion, sparking generations of socioeconomic segregation. Today, the viaduct that hovers over Syracuse’s urban core has reached the end of its functional life, spurring residents and the state’s department of transportation (NYSDOT) to consider next steps for the consequential corridor and how reimagining the site might transform the city in dramatic ways. This isn’t a new transportation tale, but the decisions made in Syracuse could have a major impact on the health and wealth of its locals. For nearly a decade, conversations have centered around three options for the deteriorating viaduct: replace it with a new overpass, build an underground tunnel, or design a street grid that slows traffic through downtown Syracuse and thereby spurs development and a more walkable city. 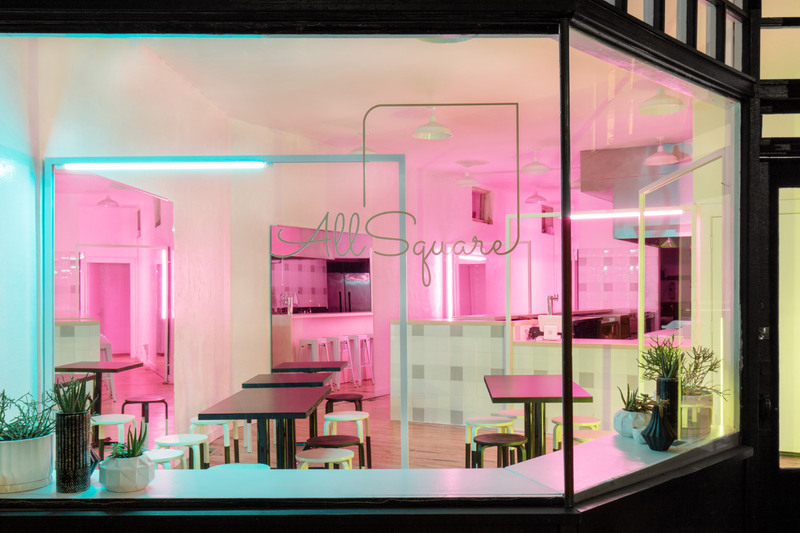 One grassroots group calling for the street grid is Rethink81. They’ve created a digital narrative that paints a clear picture of the city’s wrought history with the highway and what its future could look like. Renderings of the street grid site show new buildings, a green street, and a bike path that extends south on Almond Street in between downtown and University Hill. The street grid seems like the eco-friendliest and fiscally responsible option at $1.3 billion, but many are against it. The DOT estimates that a new elevated highway will cost $1.7 billion but take nearly ten years to complete. Some upstate members of the state legislature even favor the tunnel despite its hefty price tag of $3.6 billion, according to consulting firm WSP Global. The latest discussions—from Albany to Syracuse—center around whether the tunnel idea is still truly on the table. "It's the million dollar question," said Jason Evans, associate principal at Ashley McGraw Architects and member of ReThink81. "The tunnel seems like an excessive investment to make for what would essentially be a duplicate route for traffic to bypass downtown.” Both the tunnel and rebuilt viaduct would allow cars to zip through the city at the same rapid pace as they do today. But that’s just the problem, says Syracuse University architecture professor Lawrence Davis. The city’s biggest issues stem from the fact that hardly anyone lives, works, or plays in downtown. The mass exodus of white residents to the suburbs after World War II caused investment to be drawn away from downtown. To this day, the suburbs remain Syracuse’s wealthiest districts. “This is a vitally important thing to study because a lot of American cities are going through a similar thing and are taking a cost-benefit analysis of their infrastructure,” said Davis. “I’m arguing that the city of the future isn’t so much a concentric city but a multicentric city that’s built in the interest of everybody and provides a variety of neighborhood types.” When the viaduct was built, it cut off Syracuse’s lowest-income residents, members of the largely African American 15th Ward, from the new developments that have risen over the last several decades. This has contributed majorly to the city’s rising poverty rates. Ranked the 13th poorest city in the nation in 2016, it’s also one of the worst places for black Americans to live, according to data from 24/7 Wall Street last year. These stark realities date back to the decision made to build the highway in 1957. Yusuf Abdul-Qadir, Central New York chapter director of the New York Civil Liberties Union (NYCLU), helps educate the local community and university students on the multilayered segregation that’s resulted, and how this modern moment in Syracuse’s history could help end the physical and financial isolation so many people feel there. “A highway isn’t naturally discriminating against everybody, but it creates a number of issues,” he said. “The car has literally split the city and made parts of it less desirable for development. If you look at these constituencies and their effective income, they are living this way because nothing’s been done to provide equitable opportunities for housing choice, economic mobility, or inclusion. It’s caused generational poverty.” Abdul-Qadir and the NYCLU are putting together an expert team of lawyers, urban planners, and project councilors that will continue to fight on behalf of Syracuse’s underrepresented populations as the I-81 debate moves forward. “This isn’t just an urban movement or a policy movement,” he said. “It’s a human rights movement and we’re trying to build momentum.” As of July, the NYSDOT was working on a new environmental impact statement that details how the three options will affect the city. A draft is expected to be complete by early 2019, at which time the public will be able to weigh in with commentary. 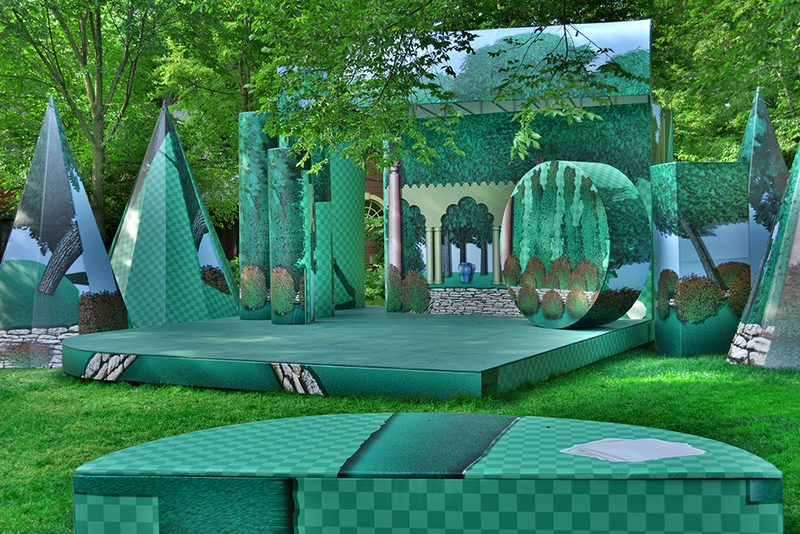 2017 Best of Design Award for Temporary Installation: Living Picture Architect: T+E+A+M Location: Lake Forest, Illinois Living Picture wraps a playful array of lightweight aluminum frames with digital imagery on vinyl to produce an immersive outdoor theater on the grounds of the Ragdale Foundation. The project digitally re-creates elements from Howard Van Doren Shaw’s 1912 design for the original Ragdale estate: low limestone walls, columns topped with fruit baskets, and a lush landscape of trees and hedges that once formed the proscenium, wings, and backdrop. By reinserting images of these historic elements among the trees and buildings of the current Ragdale estate, the project blurs the boundaries between past and present, stage and proscenium, reality and artifice. Structural Consultation: Brian McElhatten and Jorge Cobo, Arup Acoustical Consultation: Ryan Biziorek, David Etlinger, and Rosa Lin of Arup Fabrication Consultation: Shane Darwent Project Manager: Reid Mauti Project Manager: Tim McDonough Honorable Mention Project: Big Will and Friends Designer: Architecture Office Location: Syracuse, New York and Eindhoven, the Netherlands This installation redraws the popular Morris and Co. wallpaper “Thistle” (designed by John Henry Dearle) into an inhabitable visual environment. The designers suggest that wallpaper’s collapse of illusion and material are a problem where multiple forms of knowledge must meet. Live performances bridge the installation with its surroundings. Honorable Mention Project: Parallax Gap Architect: FreelandBuck Location: Washington D.C If most ceilings imply shelter, defining the limits of the room, others suggest the opposite: extension beyond concrete limits. This winning proposal for the Smithsonian American Art Museum’s “ABOVE the Renwick” competition curates a historical catalog of notable American architectural styles and renders them through 21st-century technology and visual culture—a dose of trompe l’oeil. The two-stage Competition is open to individuals, businesses, non-profits and municipalities. Respondents are encouraged to form multidisciplinary teams. These could include, for example, urban designers and architects, planning and community specialists, hydrologists, infrastructure engineers, artists and curators, development economists, real estate developers, local officials and financing partners. Submissions from both domestic and international teams are welcome. Submission deadline is January 5, 2018. More details about the Competition structure, timeline, and submission guidelines can be found on the website. 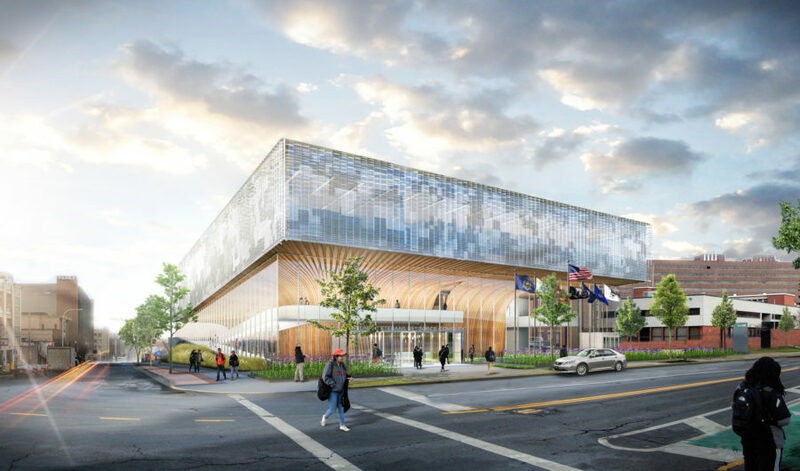 Today, Syracuse University announced New York City-based SHoP Architects the winners of a six-month competition to design the new National Veterans Resource Complex (NVRC) on the school's campus. Programmatically, NVRC will include classroom spaces for veteran-focused programming, as well as a conference center and a roughly 1,000-seat auditorium, both of which can host community activities, lectures, and national events. Gallery spaces will exhibit the robust history of veteran support at the school. The NVRC will offer state-of-the-art vocational and educational programs designed to advance the economic success of the region’s and the nation’s veterans and military families, including research and programming connected to the veteran and military sectors. “The programmatic demands on this building, its historic symbolism for the University, and the gateway role it will play on the campus dictate a very high level of performance in its design—a building that is at once inviting to all and a specialized tool perfectly suited for the specific work that will take place there,” SHoP's William Sharples said in a statement. The NVRC is part of the Central New York Regional Economic Development Council’s winning proposal titled Central New York: Rising from the Ground Up, which is part of Gov. Cuomo’s $500 million Upstate Revitalization Initiative (URI). The facility will house the Syracuse University and Regional Student Veteran Resource Center, the Army Reserve Officer Training Corps, the Air Force Reserve Officer Training Corps, U.S. Department of Veterans Affairs “Vet-Success on Campus,” the National Center of Excellence for Veteran Business Ownership, Veteran Business Outreach Center and Accelerator, Syracuse University’s Office of Veteran and Military Affairs, and the University’s Institute for Veterans and Military Families (IVMF). The committee included Chancellor Kent Syverud, J. Michael Haynie, vice chancellor of veteran and military affairs, Andria Costello Staniec, associate provost for academic programs; Julia E. Czerniak, associate dean of the School of Architecture; Jared Grace, graduate student in the School of Architecture and Army ROTC cadet battalion commander, Breagin K. Riley, assistant professor of marketing in the Whitman School of Management, Peter Sala, vice president and chief campus facilities officer, and Michael A. Speaks, dean of the School of Architecture. The process was led by Martha Thorne, dean of the IE School of Architecture and Design in Madrid. The NVRC is expected to be complete in the spring of 2019. This Syracuse mural project, S.Alt City, was sent to AN over the summer just as we were preparing our live coverage of the Venice Biennale and went unreported in the paper. But the mural by Cheng and Snyder Architects is a smart project that deserves more attention than it has received. The mural depicts a local waterside salt barge that alludes back to Syracuse's industrial heritage but it also imbedded QR codes throughout the work. These QR codes are becoming more ubiquitous in the world of art making and were in fact used in the Russian pavilion at the recent Venice Biennale in a grandiose and very expensive installation in their pavilion. 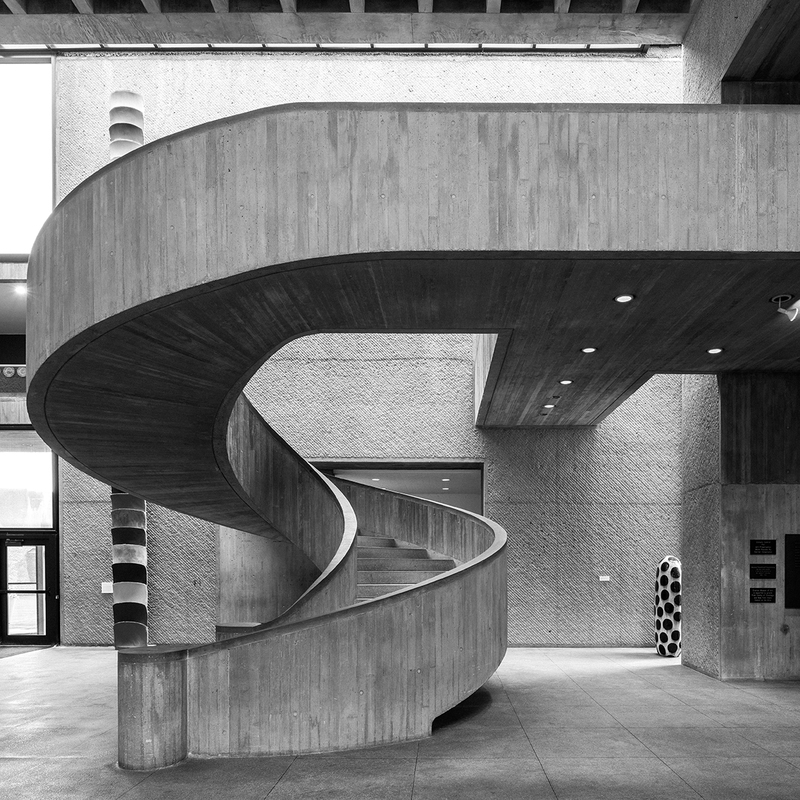 In Syracuse the young architects cleverly and cheaply utilized the QR codes to send smart phone viewers to links for contemporary arts organizations in the Syracuse region. The connection between the old industrial fabric of the city and the contemporary use of codes and cultural facilities and organizations to help bring the city back to its former livability and economic strength. It is exactly the type of "art" young architects should be engaged with today. The mural is in downtown Syracuse on a west facing wall of Lemp jewelers (on Fayette Street just west of Warren). 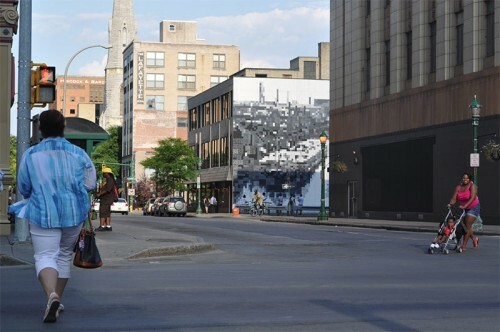 The mural is permanent and was funded by a seed grant from the Syracuse University School of Architecture (one of Dean Mark Robbin's last initiatives before he left his deanship ) as well as a larger grant from the Connective Corridor. OPEN: An Exhibition by Tsao & McKown Architects Slocum Gallery Syracuse University School of Architecture Syracuse, NY Calvin Tsao and Zack McKown aim to provide a critical context to seven projects in their OPEN exhibition, ranging from a lipstick tube to a prototypical community of 25,000 in China. The exhibition provides a theoretical framework with which to view the projects, with the inclusion of historical, cultural, and economic background research in addition to sketches and drawings that demonstrate the design process at work. Realizing the limitations of a gallery—that is, the impossibility of showing actual architecture, as well as a limited space to display information—Tsao and McKown decided to post the exhibition materials online and make the gallery a gathering space for students. In the center of the gallery, a raised platform with sides angled to provide backrest is lined with felt and populated with dozens of throw pillows (graffiti markers included). Films that have influenced Tsao and McKown are projected on a screen that runs along the back of the platform. With wall space freed up the team fill the gallery with images of their lives at work, from moonlighting on Vogue sets to work done before architecture school, allowing students to understand the details that inform and motivate their work.